Many of us have had the unfortunate experience of having to have their horse euthanized. Making the decision to 'put a horse down' is heart-rending and you will no doubt go through some very intense emotions before, during and after the event. Along with the sadness of losing a friend comes a lot of guilt. Even if the horse is very elderly, has internal damage, a foal is born with serious defects, or has had a devastating accident and there was really no decision to make, you'll still wonder if you're doing the right thing. But this is the price we pay for loving these animals, and it's our duty to ensure we don't prolong their pain or discomfort because we can't bear to part with them. Sometimes, the decision has to be made instantaneously—like in the case of a leg fracture. Although a broken leg isn't necessarily a death sentence for a horse anymore, this type of injury can fatal, and to spare the animal pain and suffering, there is nothing else that can be done. The most common way to euthanize a horse is a lethal injection. You'll need to move the horse, if possible without causing it undue pain, to a place where it will be easy to remove the body. The veterinarian will inject a sedative, followed by a large dose of barbiturates. Most horses just collapse slowly and go to sleep. Occasionally, they will lurch backward and fall, which is quite distressing for the handlers. Your vet will guide you as to how you should safely handle your horse during the procedure. A faster, but perhaps more distressing and dramatic way to euthanize a horse is with a gun. 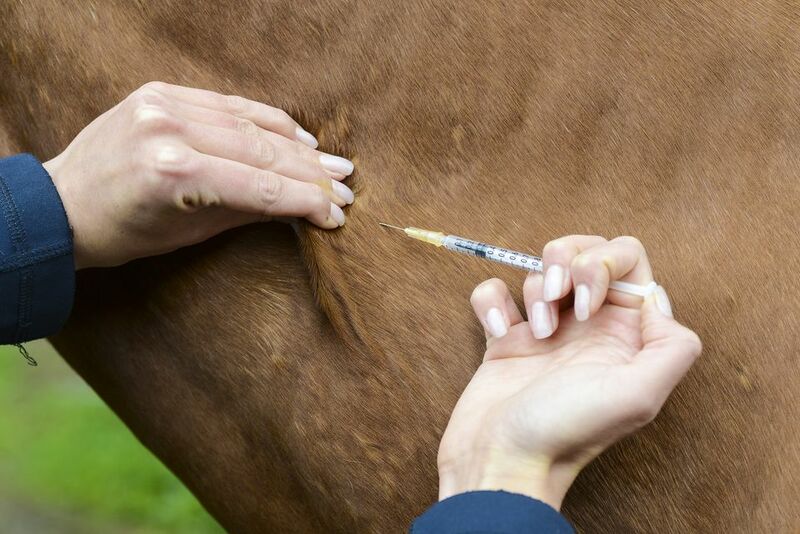 Some people feel this is a more humane method than injection because done properly, death is instantaneous, and the horse is not distressed by the presence of a veterinarian. This method should be carried out by someone familiar with the use of high-powered firearms and knowledge of where to shoot to kill, not just stun the animal. A significant amount of bleeding may occur as well. In some areas, it is possible to call the 'dead stock' service who will do the euthanization this way, and remove the body immediately. Captive bolt is another method that may be available. In most cases, this means you must transport the horse to a facility, which if the horse is very elderly, sick or injured may not be humane. In very rare, extreme emergencies—such as when a horse gets horribly injured out on a remote trail where it's impossible to get a vet in, it's possible to use the exsanguination (bleeding out) method. Large of amounts of blood will be lost, and it is risky for the handler because the horse may struggle violently if not already unconscious. This is very traumatic for both horse and handler and should only be considered if absolutely no other option exists. Talk to your veterinarian to learn more about exsanguination. After any method of euthanization, there will be a few moments of muscle twitching and perhaps the legs may move a bit. The body then relaxes and stills. If a vet is present, they will check for the heartbeat with a stethoscope, look for the pupils of the eyes to be dilated and the absence of the blink reflex. If the vet feels the brain is still active, more drugs may be administered or more steps will be taken to make sure the job is complete. After euthanasia, the body will have to be removed or buried. Some places have time limits for removing dead livestock. In most areas, the dead stock truck will come within a short time, and for a small price, take away the body. If you chose to have the body buried, you need to know the rules and regulations in your area and arrange a backhoe to dig the grave. It is possible to compost a small body, such as a foal or small pony, again abiding by the regulations in your county, state or province. In some areas, animal cremation is available. This is perhaps the most costly option. Zoos and wildlife sanctuaries may welcome the body as food unless barbiturates were used for the euthanasia. For this reason, also, it's important to prevent the body from scavenging by animals like stray dogs or coyotes. The decision to euthanize a horse is never easy. But knowing what to expect and that you are doing the best you can for your horse should bring you some small comfort in an otherwise distressing process.